The video for Soul Asylum’s 1993 smash hit featured real missing kids. Some eventually came home; some never did. 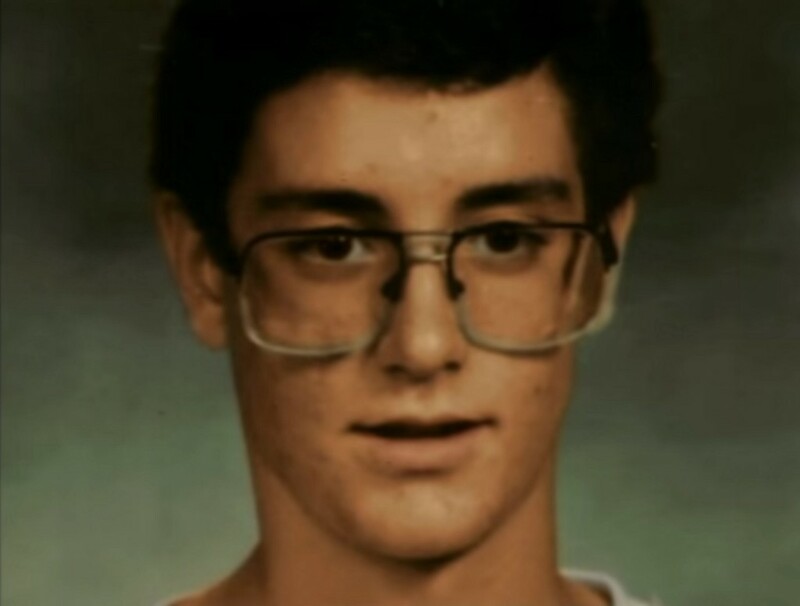 On a Friday morning in April 1990, Christopher Matthew Kerze, 17, told his mother, Alona, he had a headache. And so, having no reason to suspect otherwise, she agreed he could stay home from school and went to work. Something important came up + feeling somewhat better. The words “get lost” were underlined twice. Alona found that the family van was gone, and their dog B.W. Bowser, who tended to be leashed during the day, had gotten loose, which she thought was odd. By 10 p.m., there was still no sign of her son. Alona called her sister, who lived in the area. Then she called her husband, Jim, who had left the Kerzes’ house in Eagan, Minnesota, early that morning. A credit analyst, he’d gone to Wisconsin on business. Jim immediately drove home, and he pulled into the driveway around midnight. Still no sign of Christopher. It was at this time that Patrick, Christopher’s younger brother, told his parents that Jim’s Mossberg bolt action 20-gauge shotgun, which was kept in a closet — separate from the ammunition — was gone. “We just went crazy at that moment,” said Jim. Christopher’s disappearance did not, at first, receive much media attention. Eagan, a city of about 64,000, has a fair number of such cases. “It wouldn’t be unusual for us to have two or three runaway missing person cases in a weekend,” said Stefanie Bolks, a detective in the Eagan police department who calls herself “a longtime copper.” Since Christopher went missing, she said, hundreds of minors in her jurisdiction have run away. But only one other person — a young woman who has been gone for two and a half years — remains unaccounted for. Christopher loved to camp. Loved to ski. He was adept at playing with the software of a computer — an original Macintosh — back when such an activity was still relatively esoteric. A friend’s dad owned a warehouse, and they’d play laser tag. He played cello in grade school, clarinet in junior high and high school. “He was a smart kid, a good sense of humor,” Jim said. When Bolks inherited the case, in 1994, Christopher had been gone four years. The local investigation had reached a dead end. Nothing was found of the boy’s clothing, his glasses or the gun, and the police department had received only “a handful” of tips. But there was reason to hope that all of this might change, as Christopher’s case had recently gotten a great deal of publicity. The attention came in the form of a music video for a song called “Runaway Train” by the alternative rock band Soul Asylum, who, in 1993, were at the height of their success. The group had just released their sixth — and most popular — album, Grave Dancer’s Union, which ended up going triple platinum. “Runaway Train” — which would remain on the Billboard charts for more than 40 weeks, and which the band would play at Bill Clinton’s inaugural ball — was one of its singles. The idea for the song’s video had begun with a milk carton — and, by extension, another missing kid. “Runaway Train” is a power ballad about depression. But Kaye decided the music video ought to be about something else: missing children. Over the course of four and a half minutes, the video toggles between footage of the band singing — the stuff of traditional music videos — and kids making a break for it; at the end, it depicts an abduction. Dotted throughout are photos and names of real missing children along with the date on which each disappeared. Further requisites: The children had to have been missing for at least a couple of years; their absence must have been reported to the police and entered into the Federal Bureau of Investigation’s national crime database; and, finally, it was imperative that parents grant permission to disseminate their child’s photo. At the time, according to Allen, there were 1.6 million runaways a year. (National Runaway Safeline also uses that figure as a baseline.) While many return home after a short time, Allen knew it was the kids who had been gone a while that were at greater risk for harm. The reality, to which “Runaway Train” alludes in its closing minute, is that sometimes what looks like a runaway is actually an abduction. “You don’t ever really know, in most missing persons cases, what the circumstances are,” Allen noted. “I liked a guy who was older than me and my parents told me no,” said Liz Vatovec, née Wiles. She’s now 39, and lives with her husband outside of Nashville, where she is a real estate broker and a licensed contractor. It was oddly jarring to realize that the blonde kid from the decades-old photo of her reunion with her mother was my senior. I contacted a few of the children — that is, the lucky ones who lived to no longer be children — from “Runaway Train.” Of the ones I reached out to, only Vatovec agreed to be interviewed. Elizabeth and her mother. Photo by Mike Stewart. Wiles, then 13, left her family’s home in Lamar, Arkansas. She and her boyfriend, Ron, hitchhiked to California, where she and her family had lived before moving to Arkansas. He worked odd jobs until they could afford a place of their own. They told anyone who inquired that she was 17. “People didn’t seem to be overly concerned about a 17-year-old having a dysfunctional family and leaving home, and people kind of sympathized with me a little bit and just looked the other way,” she said. They stayed for two and a half years. In May 1993, Elizabeth and Ron were at a friend’s house in San Diego. The television was on, and they weren’t paying much attention to it. But then Wiles saw her own face on MTV. Her biological father, Duane, had — without consulting Elizabeth’s mother, Debra, from whom he was divorced — given her photo to the National Center for Missing & Exploited Children. The video had begun airing that month. “I just kind of freaked out,” she said. A week later — she’d hesitated, at first — Elizabeth called her mother, who had not heard from the girl, not even a postcard, since she’d left home. And, as they wept, Elizabeth apologized and said she wanted to come home. There were no recriminations; Debra was just happy to have her back. When she came home, there was a return to relative normalcy. There were house rules she had to abide by. After a few months, Elizabeth got a GED. She attended college but never finished. Because of Soul Asylum’s agreement that the video would be recut whenever one of its runaways returned home, multiple versions exist. One of the versions on YouTube has far more views than the others: nearly 60 million. It’s in that version — if you stop it at precisely three minutes and 30 seconds — that you can see a photo of Martha Wes Dunn. In the photo, she is holding a black dog. The 15-year-old, who had a scar on her cheek from a childhood injury, vanished from Daingerfield, Texas on September 5, 1990. 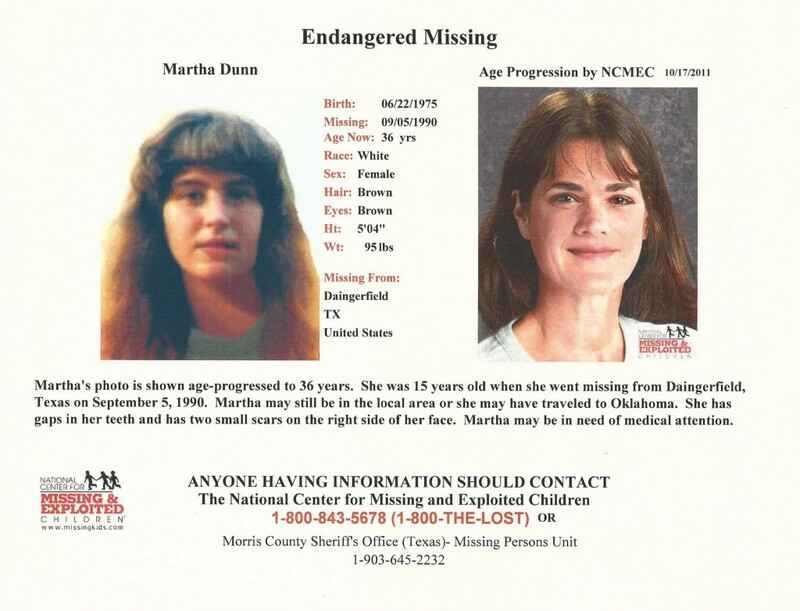 Her father reported her missing around 5 the next morning, and Deputy Martha Cox took the case. I spoke about Dunn’s case with Morris County Sheriff’s Department’s Chief Deputy Robbie Gray, who has been on it since 1999. Dunn had been in Oklahoma with some relatives. Her parents had brought her home to Texas to start the school year on September 4. She’d been unhappy about it and they’d argued. The last time they saw her was at home on September 5 around 2:20 p.m. It’s known that that night, around 10, Dunn spoke with her boyfriend, 17-year-old Eric Owens, by phone. The next day she and Owens were gone. One theory held that they had run away together to live in Hayworth, Oklahoma, where Owens’ aunt lived. The couple was reportedly seen there “several times.” (The aunt denied this.) Another theory: They’d hitchhiked to Kansas, where Owens’ mother lived. Wichita, perhaps. Neither story panned out, said Gray. Neither Dunn nor Owens has been seen again. By the time “Runaway Train” aired, said Gray, “things went cold.” Even the popularity of the video couldn’t move the needle much. There was a tip that Dunn was working as a waitress near New Boston. (“Of course, I called over there and that wasn’t true.”) About a year ago, Gray heard about a woman in Mississippi who reportedly resembled Dunn’s age progression photo. That, too, came to nothing. And that, he said, was the last time anyone has called about Martha Wes Dunn. I just hope your out there this video is for my sister she went missing in 1990 never to be seen again.We have been to oklahoma and other places she might would be was told she was ok and to just leave it alone. But we can’t just back down and forget about her we just want to see her again. The police put her down as a run away couse of her age. Eric Owens come to our house and took her they were into drugs pretty bad and our only conclusion is that she can’t get back to us couse she couldn’t find us so I done this video for her. If your watching siss we love you and just want you back. Attempts to reach Holstine were unsuccessful. “Runaway Train,” said Dave Pirner, was a miracle: “We were able to turn a blatant promotion item into a public service announcement and got away with it.” Since Grave Dancers Union, Soul Asylum has gone on to release five more albums. In fact, Pirner and his band — of whom he is the only remaining original member — released a new album in March called Change of Fortune. It’s been more than 20 years since the song’s release, but to Pirner’s astonishment and maybe consternation, it continues to resonate. (The video immediately spawned imitators. There were, at the very least, versions in the U.K. and Canada with entirely different children.) When we talked in September, he’d just been contacted by a Syrian man who wanted to use the song with a photo collage of children who had been maimed by war. 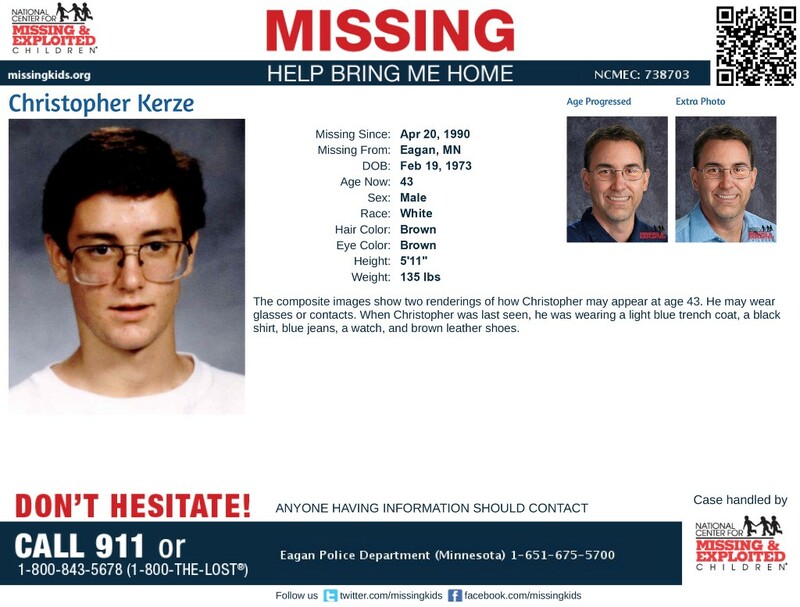 For me, the story begins and ends with Christopher Kerze, who disappeared that Minnesota spring 26 years ago. The arc of his life is devastatingly incomplete. Furthermore, wrote Kerze, he intended to commit suicide. He declined to give a reason. But he understood how deeply it would hurt those he loved, and for that he expressed regret. The next day, two days after Kerze was last seen, police found the family’s van abandoned by the side of the road in Itasca County in northern Minnesota, about 20 miles north of Grand Rapids. The uncertainty is, for Jim Kerze, both hope and torment. But he hasn’t given up. “My pipe dream is that Christopher works for a little company in Cleveland, is married and has three kids. He’s not a back room employee, but a very quiet employee. He’s not a person who would lead the charge. He’s one of those guys in the back to hold the place together.